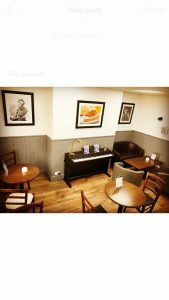 If you need space for a small conference, party or meeting, the upstairs room in the bagel bar could be ideal. It’s fully equipped with projector & screen so just plug in your equipment and off you go! We can supply a selection of our Premium & Regular Filled Bagels, homemade coleslaw & vegetable crisps for a healthy & substantial buffet-style meal. Hot & cold drinks also available as well as a range of sweet options. Looking for a meeting room for upto 15 people, with or without lunch? Please contact us for further information.